A combination of general dental care and preventative education will help maintain a radiant smile and encourage healthy oral hygiene. Our general dental services include diagnosis, treatment, and management of overall health care needs, while also providing preventative education to empower you with the knowledge to maintain your best smile! If you are experience a dental emergency, please call us immediately. When dental emergencies are left untreated, you risk the chance of oral trauma and further complications. Our teeth are strong, but they require proper oral care and maintenance to prevent wearing or chipping away. Individuals who grind their teeth or those involved with sports need to take cautionary measures to protect their smile. Implant dentistry provides dental solutions for replacing single to multiple missing teeth. Dental implants serve as a replacement for root and tooth, thus restoring strength, stability, resilience, and support to the mouth and jawbone. Implants are surgically placed to the upper and lower jawbone of your teeth. When attached, an implant will look and feel like a natural tooth, which not only restores your smile but enhances it. Subperiosteal implants — these consist of a metal frame that is fitted onto the jawbone just below the gum tissue. Oral sedation is used in certain dental procedures that require a patient to be deeply relaxed. To sedate patients, dentists can use pills or nitrous oxide, which also known as laughing gas. Perhaps you have watched a television show or movie in which a character receives some form of sedation, usually the laughing gas, and immediately relaxes. Inhalation sedation actually helps to reduce or eliminate anxiety for the fearful patient. If you’re interested in learning more about how we use nitrous oxide in our practice, feel free to contact us by phone or email. We’re happy to address all of your concerns and inquiries! Lurking beneath your gumline is bacteria that can cause gum disease. When left untreated, it’s the #1 cause of adult tooth loss in the United States. Despite the facts and statistics, many people continue to ignore their dental professional’s advice to treat gum disease in its early stages. That’s why we encourage you to take proactive measures. If you take action now, you can prevent the disease from progressing any further. Leaving it untreated may cause more serious problems and can potentially require painful, expensive surgery. Implementing scaling and root planning (SRP) to your treatment, your dentistry can also apply Antibiotics to help treat your gum disease. A sealant is a clear or shaded plastic material that is administered to the chewing surfaces of the back molars. The back teeth are where decay most often occurs. A sealant prevents tooth decay by covering the pits and grooves of chewing surfaces and sealing out decay-causing foods and germs. Please feel free to call one of our dental offices for more information about how this service can help you! 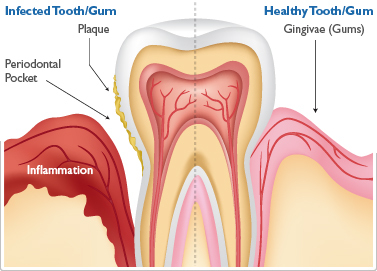 Periodontics deals with the gums, tissues, and bones that support the teeth. It is preventive in nature and mainly concerned with preventing and treating periodontal or gum disease. We offer deep cleaning services at our practices, including scaling and root planning. We are committed to maintaining our patients’ overall oral health. We gladly work with you to help you achieve long-lasting oral health. We offer Scaling and Root Planning services. Call us today to learn more about from one of our experienced dental professionals!